I know what I want from data. I want to see increases, decreases, clumps of numbers or gaps in percentages that point to an obvious starting point for a story. I want to grasp the hard evidence that show trends emerging, lives improving or shifts in behavior. But data sets can be daunting. Loads of tables and rows, dates and percentages can make most journalists recoil in fear or lapse into daydreams. In many other cases, however, I’d open the links and feel overwhelmed, such as when I received data for emergency department use across California’s more than 200 hospitals. I knew this was good stuff because it would offer a look into what had changed in the state’s network of care since the Affordable Care Act became law. Instead of anecdotal stories about the state of health care and what was happening inside emergency departments, the data offered solid proof that changes had occurred. Data reporter Ian Wheeler of the Orange County Register, part of the Southern California News Group, organized the data and isolated hospitals in four counties, a solid start. But I wanted to learn what more I could “ask” the data. Through the 2017 California Data Fellowship, I learned how to more efficiently use formulas and shortcuts to extract specific information. We wanted to build a profile of what was happening in four counties for readers served by our publications. I wanted to get a deeper look into who was using the emergency departments with the most frequency. What were they going in for? What kind of insurance did the patients have? My focus was to look at the big picture of emergency department use in Southern California after the Affordable Care Act went into effect. As Ian and I dug deeper into the data, we saw some patterns emerge. The tide of emergency department visits rose after the main provision of the Affordable Care Act became law, growing about 27 percent from 2010 to 2016, nearly six times the population growth rate of Greater Los Angeles. But admissions fell. 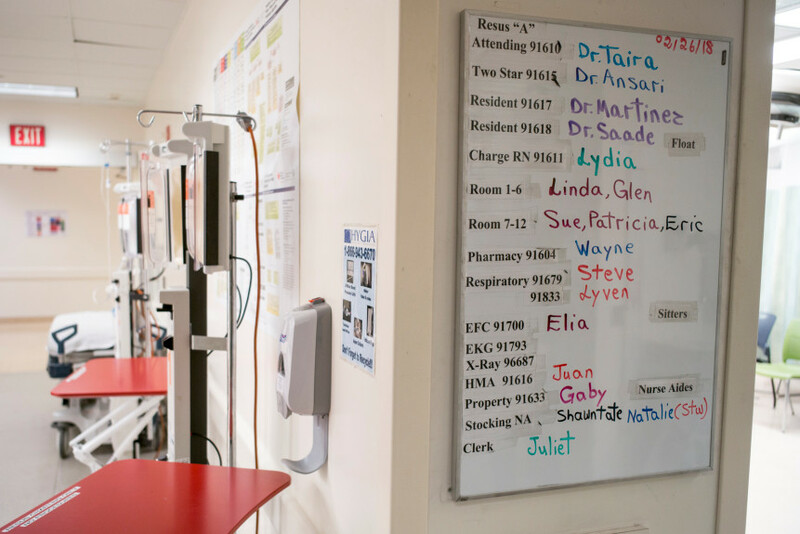 Through interviews with emergency department physicians, we learned homeless people, people reporting mental illnesses, and others insured for the first time are among the bulk of those still visiting emergency departments — many were seeking primary care for chronic conditions such as diabetes and high blood pressure. They were coming to the ER because access to primary care had yet to catch up with all the newly insured, experts told us. We saw Medicaid recipients grow from one-quarter to nearly half of emergency room users in Southern California, including Los Angeles, Orange, Riverside and San Bernardino counties. While the share of patients with Medicaid rose, uninsured ER visitors fell from 18 to 8 percent. Visitors with private coverage slipped from 32 to 26 percent. But the numbers raised other questions, and we next wondered about wait times. For that, we had to turn to another set of data, also provided by OSHPD. Ian analyzed the data to show that despite the jump in visits and admissions, Southern California’s ER average wait times — minutes people spend in an emergency department before they’re seen by a health care professional — appeared to improve slightly from 2013 to 2016 since 2013, as the ACA took effect. We also wanted to isolate hospitals that had seen the most visits. I was surprised to learn that most visits in all of California occurred in San Bernardino County. But here is an example where the data say one thing, while digging deeper leads to an unexpected explanation. Ian noted that Kaiser Fontana had the highest number of visits in the state, but when questioned, Kaiser officials said they had given OSHPD officials numbers for two of their campuses in the same county. Still, we used the data to highlight the hospital system’s dominance in the area. We also noted that San Bernardino County showed more growth in population at around the same time the Affordable Care Act went into effect. As a result growth, Kaiser expanded its hospital and emergency department, and had opened a smaller facility nearby. The data gave us solid evidence to ask experts important questions for our region: Is the Affordable Care Act working? What can be done better? Our reporting elicited some interesting responses, including an acknowledgement from ACA proponents that people were still learning how to use their insurance coverage, and that community clinics need to stay open later on evenings and on weekends. The best image used to describe not only the numbers but the phenomenon of what was happening at emergency departments came during an interview with Anthony Wright, executive director for Health Access: Think of it as a snake swallowing an elephant, he told me, adding that the snake was like the health care network, while the elephant was the mass of newly insured patients learning how to use the network. It would take time, he and other experts noted, for people to learn that emergency departments aren't there for primary care. There’s some preliminary evidence that may be happening. Data for 2017 show that while an increase in ER visits continued, the increase was smaller than a year before, which may mean that the health care network is starting to absorb the backlog of patients, and patients are learning how to use less costly options such as urgent cares and community clinics.